Professional cleaning demands high standards of engineering and quality. Kärcher brush-type upright cleaners incorporate modern technology and unique product benefits that meet all the requirements of professional vacuuming, sweeping and maintenance. Everything is engineered to the quality you expect from Kärcher: No compromises have been made. A manual adjustment enables you to set the brush to the ideal height for the pile being cleaned. If the brush becomes blocked for any reason, an patented centrifugal clutch lifts off the unit before any harm can be done. Suction tube (ID 35 cone) for problem areas. Kärcher upright vacuum cleaners are equipped with a detachable suction tube for vacuuming upholstery and getting into awkward corners and other difficult-to-reach areas. The replaceable brush roller is very simple to change (after mechanical wear of the brushes or to use a stronger brush roller with red bushes as an optional accessory). An automatic brush pressure release mechanism is activated when the unit is at a standstill to keep the brush in perfect shape and avoid damage to the carpet. 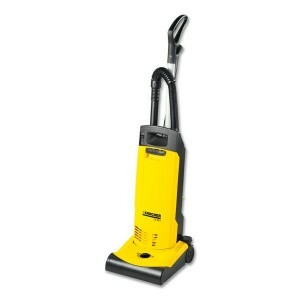 Up to medium large areas are cleaned quickly with the CV 30/1. For using in shops, showrooms, offices, ticket halls, hospitals, hotels, restaurants, nursing homes or private households, the working width of 300 mm cleans even large areas in no time. The metal sole plate ensures a long service life in tough professional applications. Two joints between the brush head and body are designed to withstand the high flexing loads that occur in continuous-duty applications. A lot of thought has gone into Kärcher upright vacuum cleaners.